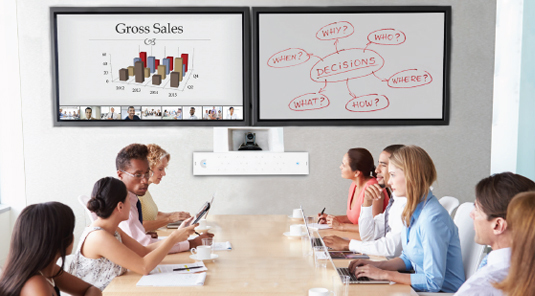 Video Conferencing Solutions – XS Applied Technologies Inc.
COLLABORATE® Pro 900 offers a complete Media collaboration solution to meet today’s diverse organizational demands for conferencing, collaboration, and communication. Its versatile design makes it ideal for multiple applications including videoconferencing, professional audio conferencing, wireless presentations and collaborations, training and corporate announcements etc. COLLABORATE Pro 900 is perfect for both single-site collaboration and multi-site collaboration with up to 25 locations where users can join from anywhere, using any device – pc, mobile, room endpoints, or telephone. COLLABORATE Pro 900 can also function as a media-streaming appliance to capture and stream voice, video, and data to large audiences located in the same or different networks. CONVERGE® Pro 840T audio mixer and Beam forming Microphone Array and guarantees unmatched sound and the most natural audio conferencing experience.